Along with participating in loads of fun-filled Bahamas kids activities, youngsters visiting the islands can learn a lot about marine life and the importance of treating the sea and its inhabitants with respect. 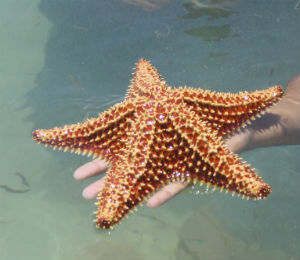 Trips to the beach, snorkeling expeditions and excursions to aquariums expose kids to a myriad of fascinating creatures, including the tiny but intriguing starfish. Starfish are actually not fish, but are echinoderms, related to creatures like sand dollars, sea cucumbers and sea urchins, all of which have a five-point body plan like the sea star. Scientists are currently attempting to replace the name with the more appropriate label of sea star. Named for the five star-like arms of the most common varieties, various species of starfish may also have ten or 20 arms, while the sun star may boast up to 40 limbs. The species if notable for their unique ability to regenerate their arms and sometimes even their entire body, something they’re able to do because nearly all their vital organs are located in their arms. Though some need to have their central body intact to regenerate, other sea star varieties can regenerate out of just a bit of severed arm. This little creature may even drop an arm on purpose to escape a predator. Though they may appear smooth-skinned, a sea star's skin is actually bony and calcified, covered with tiny spines that serve to protect them from natural predators. The soft underside is also protected with these spines. Sea stars do not have blood, but rather a water vascular system, which means that sea water is pumped in through its sieve plate and into the tube feet, causing them to extend and retract so the animal can move and eat. Sea stars may be blue, grey or brown or may be brightly colored in red or orange hues to scare away potential predators. They have a simple eye spot on the end of each arm and can move surprisingly fast. Sea stars are notable for their unique ability to actually eat their prey outside of their bodies. After prying open bivalves like clams or oysters with their suction-cupped tube feet, the sea star’s cardiac stomach comes out of its mouth and squeezes inside the shell of its prey, digesting the animal on the spot. The stomach then returns to the body. This enables the sea star to devour prey that is much larger than its mouth, with a diet including oysters, small fish, arthropods and mollusks. Sea stars themselves are potential feasts for a number of creatures, with natural predators including sea otters, birds and fish. Sea stars are one of the few species that live only in marine habitats, with no freshwater varies, although a few can live in brackish water. There are nearly 2,000 species and they may live in deep water or the intertidal zone in either cold or tropical waters in all the oceans of the world, even under the ice in Antarctica and the deep abyss! All live on the ocean bottom, though larvae swim in the water column. With habitats ranging from tidal pools and rocky shores to coral reefs, kelp forests, sea-grass meadows and the deep-sea floor, various species of sea stars can be found all over the world. The greatest diversity, however, is in coastal areas.